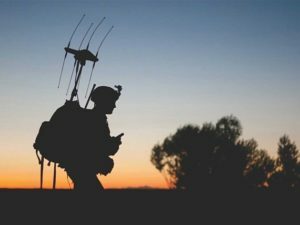 Recently, the US Army asked experts in the defense industry for information on the most innovative, reliable electronic warfare (EW) technologies as part of the Multi-Domain Electronic Warfare Capabilities (MDEWC) Project and Multi-Domain Battle (MDB) Concept. These initiatives are centered around identifying and filling any technology gaps in US EW capabilities – and doing so in collaboration with all branches of the US military. Mission-critical operations start on the manufacturing floor. There’s a non-negotiable level of stringency that has to occur for MDEWC and MDB to be successful. Everything from traceability in the supply chain to testing methods must be airtight. Size, weight, and power (SWaP) are more important than ever. To fit on next-gen platforms, amplifiers and microwave power modules must shrink in size and weight while remaining highly powerful and efficient. Engineers must be forward-thinking. The engineers who develop and create products for multi-domain programs must navigate the ever-changing electromagnetic spectrum. Likewise, they must understand the gravity of designing products that can make or break an operation. dB Control aims to make sure we live and breathe these three points. We understand that the reliability of our products goes beyond the testing room floor and affects real people. With programs like MDEWC and MDB underway, it is even more important for us to ensure our TWT amplifiers (TWTAs) and microwave power modules (MPMs) meet the challenge of collaborative, multi-domain operations. Take our dB-3756HE for example. It’s the first generation of high-efficiency MPMs optimized for SWaP and extended missions in high performance radar and synthetic aperture radar (SAR). This month, the dB-3756HE, along with some of our other most highly requested products will be on display at the International Microwave Symposium in Philadelphia. While you’re there, be sure to stop by Booth 456 to see what dB Control brings to the field.